Apple has announced that it’s getting out of the router business. The Cupertino firm will be selling off its remaining AirPort router inventory via Apple Stores and authorized retailers, but will not restock. That said, no price drop has been announced. 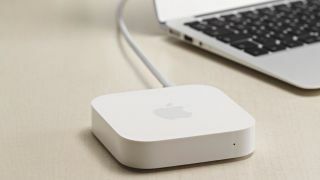 The company will, however, continue to support the existing routers – including AirPort Express, AirPort Extreme and Time Capsule – for the next five years, providing software and firmware updates. Given that support won’t be indefinite, Apple will post buying guides online to help AirPort owners looking for a replacement for their old base stations. While the loss of the AirPort routers might be disappointing for fans, this news comes as no surprise. Apple last updated the Extreme and Time Capsule base stations in 2013, while the Express hasn’t been supported since 2012. In fact, in November 2016 Bloomberg reported that the company had disbanded its router development team. And with 802.11ac Wi-Fi routers becoming ubiquitous, it’s no surprise that the old Apple routers are now redundant. Whether Apple’s exit from the router market is permanent or not is yet to be decided, though. A spokesperson told Engadget that “the company might revisit Wi-Fi routers if it can make a meaningful contribution to the space”.